Functionality. Versatility. Quality. Precision. These are the words that roll off the tongue when one seeks to describe Victorinox. Long one of the most respected brands in Switzerland, Victorinox is responsible for the Swiss Army Knife-that symbol of Swiss ingenuity, precision, attention to quality, functionality, and preparedness. If you are looking for well-designed time pieces that embody all these values, you should definitely consider many of the timepieces offered by Victorinox. Its compact designs, sleek look and attention to detail is legendary. Best of all, many of Victorinox’ time pieces are priced very reasonably. Quite a feat for one of the most respected names in Swiss manufacturing. The Victorinox Swiss Army Men’s 241432 Maverick GS Black Chronograph Dial Watch embodies all of the values that put the Victorinox brand on the map. High functionality. Sleek design. Integrated design. While it is far from the top of its particular watch class, the Victorinox Swiss Army Men’s 241432 Maverick GS Black Chronograph Dial Watch puts in a good showing. It covers the bases for a typical sports luxury watch-multiple chronographs and sporty look. It is able to achieve all this while coming in at a relatively budget-friendly price. What else would you expect from one of the biggest names in Swiss manufacturing? This is a fairly decent showing for Victorinox. The multiple chronograph setting of the Victorinox Swiss Army Men’s 241432 Maverick GS Black Chronograph Dial Watch as well as its overall sleek look definitely acquits Victorinox well in the sports watch category. While far from a Breitling or TAG Heuer, Victorinox hits the sports watch formula well enough to produce a decent sports watch at a relatively very accessible price. If you are trying to understand why a watch designed by one of the most recognized brands in Switzerland comes at a relatively modest price, you don’t need to look further than its Swiss Quartz movement. Sure, this high precision movement is Swiss through and through. But that doesn’t remove the fact that you’re still wearing a quartz watch. Considering the big divide between automatic and quartz in Swiss watchmaking, it’s understandable why this time piece is priced at such friendly levels. What’s the point of wearing an awesome sporty watch when you can’t read the time when the sun goes down? Living up to its Swiss Army knife functionality and practicality, the Victorinox Swiss Army Men’s 241432 Maverick GS Black Chronograph Dial Watch is luminous and can be read at night. 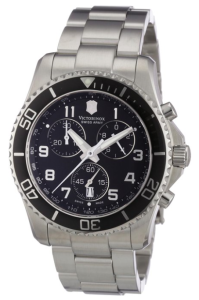 If you are looking for a practical sporty watch that is well put together, you definitely should check out Victorinox Swiss Army Men’s 241432 Maverick GS Black Chronograph Dial Watch. It is very practical and makes for a great outdoor watch. It is very presentable and can be worn in a wide range of settings. Best of all, you get to tap into the rich manufacturing history and expertise of Victorinox without breaking the bank.